Chip Auger, USB Port, 23” x 52” Table, Front Tooling Storage Racks. 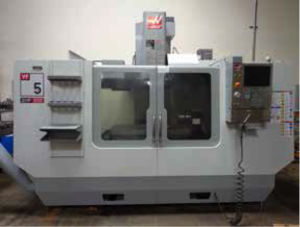 (MAR/2011) Haas ST-30 CNC Turning Center s/n 3088111 w/ Haas Controls, Tool Presetter, 12-Station Turret, Hydraulic Tailstock, 30Hp Motor, 3400 RPM, Rigid Tapping, 10” 3-Jaw Power Chuck, Coolant. Hitachi mdl. S-570 Scanning Electron Microscope w/ Raster Rotation / Dynamic Focus / Tilt Compensation Unit, Control Panel, Large Screen Flat Panel Monitor, Computer and Acces. Thermo Fisher Scientific TN3000 mdl. 3000-UV-F Tn/S/Cl Total Nitrogen Analyzer (Nitrogen/Sulfur/Chlorine) s/n 303TNU132901 w/ NeXYZ Universal Sampler Unit, mdl. 300TS Module (Sulfur), ECS Module TS/TX Coulometer Cooling Module (Chlorine), EGM III Sulfinert Gas/LPG Introduction Module, Computer. (2) Perkin Elmer “Clarus 580 GC” Gas Chromatographs s/n’s 580S14031804, 580S13070214. (3) SRI Instruments mdl. SRI 8610C Gas Chromatographs s/n’s N7745, N7408, N7277. SRI Instruments mdl. SRI 310C Gas Chromatograph s/n N7429. Perkin Elmer “Quantulus 1220” Ultra Low Level Liquid Scintillation Counter s/n DG04129157. Anatech USA mdl. HUMMER 6.2 Sputtering System s/n 1027145. (2) Pfeiffer “HiCube 80 ECO Turbo Pump Stands s/n’s 15162489, 115162465 w/ Extorr XTM100 Residual Gas Analyzers. Scienscope SSZ Series Trinocular Video Microscope mdl. SZBD-T3 s/n SZBDT3 200912012 w/ Computer and Lens Sets. National Stereo Microscope w/ Light Source. ARS Enterprises mdl. 852121R Autoclave System s/n 0619102993 w/ Digital Controls, Sussman Electric Boiler, Chart Recorder. MHI Micropyretics Heater International mdl. MHI OAB-4-750 Steam Generator (NEW). Aeromist mdl. 52300 Steam Generator s/n 30802. Grabner Instruments / Amatek “Minidis ADXpert” Automated Distillation Analyzer s/n 25-910-0107. Parr mdl. 1341 Plain Jacket Bomb Calorimeter s/n 1341-0911-132779 w/ Parr mdl. 2901EB Ignition Unit s/n 1115/50/60, Parr mdl. 6775 Digital Thermometer. Sanda mdl. CE2010 Precision Dispenser s/n 121. Sanda mdl. FACTS CE2010 Mulit-Titrator s/n 167. (2) Thermo Scientific Lindberg BlueM mdl. TF55030A-1 1100°C Electric Tube Furnaces s/n’s W2-V-52569-XV, U25V-524725 w/ Digital Controls. (2) ThermCraft mdl. 1-1-20-230-E15SP-C2278 Electric Tube Furnaces. Thermo Scientific Thermolyne mdl. F21135 Electric Tube Furnace s/n 1260081106189. Labconco mdl. 5220100 Precise Controlled Atmosphere Glove Box s/n 091016809B w/ Labconco Digital Pressure Controller, Oxy-Sen O2 Monitor, Platinum Vacuum Pump. Labconco mdl. 2246500 Protector Laboratory Hood s/n 09106699F. Omega TempScan/1100 High Speed Temperature Measurement System. TIF mdl. TIF3340 4-Channel Thermocouple Thermometer Plus Infrared Thermometer. (3) Extech “Oyster Series” mdl. 412300A Current Calibrators. (2) LMI Microprocessor Dosing Pumps. Leeson Speedmaster Adjustable Speed AC Motor Controllers. Engine, Automatic Trans, AC, Trailer Package, 21,802 Miles VIN# 1FT7X2A62CEB40454. AC, AM/FM/CD, 25,024 Miles, VIN# 5TDKAA3DC9CS009907. 2009 Ford Escape Limited Hybrid SUV Lisc# 6LGV035 w/ 2.5L Hybrid Gas Engine, Automatic Trans, NAV System, AC, Sun Roof, 32,092 Miles, VIN# 1FMCU493X9KB209111. Nissan mdl. MJ1FA35LV 7600 Lb Cap LPG Forklift s/n J1F4-980518 w/ 3-Stage Mast, 187” Lift Height, Side Shift, Yard Tires, 412 Metered Hours. Lincoln “Advantage 400” Towable Diesel 400 Amp DC Welding Power Source and AC Generator s/n U1111206290 w/ 120/240 Volt Output, 148 Metered Hours. Generac GP5000 Gas Powered Generator w/ 120/240 Volt Output. DynaGen mdl. ES52 Gas Generator w/ 120 Volt Output, 10.7 Metered Hours.